The controversial Senator Dino of Kogi Central is hitting the media again with his eloquence and resonant speech. The Senator with a favorite quote of. ‘if you lie, you die; if you speak the truth, you die” decided to speak to speak the truth according to him, the yesterday’s plenary session of National Assembly. He called on the Senate President to question the activities of the executive arm of government over the continued refusal of the Presidency to sack Ibrahim Magu as the Acting Chairman of Economic and Financial Crimes Commission, EFCC. He charged the Senate President, Bukola Saraki to protect the power of the legislative arm of the Nigerian government. “The inconsistency of the executive to choose what to do despite legislators’ rejection should be checked. 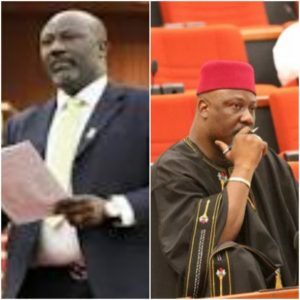 The Senate cannot be disregarded or insulted”, Melaye emphasized. “Magu is not the last Nigerian Angel”, he ended on the case of Acting Chairman of EFCC, Ibrahim Magu. In the video posted on the Nigerian Senate page this morning on Facebook, various people have now reacted to Melaye’s submissions. Some condemned the senator while some other celebrated him for his ability to voice out.